Peter Pettigrew | Expecto Patronum! Hold Scabbers in the air and listen to him squeal. 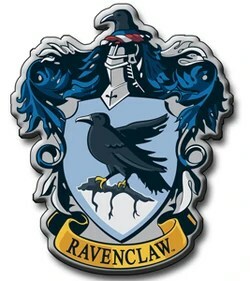 COLLECT scarab beetle bodies from the plaster heap in back of Wormtail, on the Sirius side. COLLECT spider legs from the plaster heap on the Lupin side of Wormtail. DISCLAIMER: This is not exactly a live blog and it’s definitely not a Finder’s Guide. It’s what I’ve found so far. According to my magic completion bar, I have found everything in this chapter! Just a single zoom again. Nothing to collect. You can, however, listen to Lupin’s story about the Marauders transforming into Animagi. 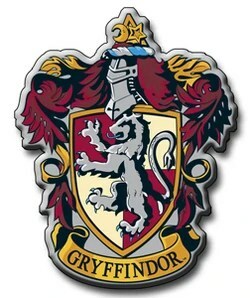 If you hover your cursor, you can also make Padfoot sniff in kind of a snarly way. DISCLAIMER: This is not exactly a live blog and it’s definitely not a Finder’s Guide. It’s what I’ve found so far. According to my magic new completion bar, though, I have found everything in this chapter! This scene has only one zoom level, but the artwork is, again, wonderful. I think “great artwork” is going to be a recurring theme in talking about the new scenes. Illuminate the scene by hovering cursor over Harry’s wand. Can see Ron disappearing into the Whomping Willow. Click on the Invisibility Cloak between Harry and Hermione to make it disappear. (Thanks, Ritwik!). Make Whomping Willow branches move with your cursor. UNLOCK Secret Keeper (interesting that we click on Sirius to get this info). Hover cursor to make candles glow brighter. When cursor passes far wall, plaster and other building materials fall on the floor. COLLECT black beetle eyes from the plaster heap on the floor. COLLECT woodlice from the wall in back of the plaster heap. COLLECT mushrooms from the side wall of the Shack. October 31 is without question the most important single calendar day in the Harry Potter series. Voldemort murdered Harry’s parents on October 31. And significant events occur on each of Harry’s first four Halloweens at Hogwarts. Halloween 1981. Probably the most important event in the series occurs on this Halloween – the murder of James and Lily Potter. With their murder, Harry Potter was orphaned, he acquired his scar (which is not merely a scar – but a piece of Voldemort’s soul), and as a result he became the “Chosen One” – the only one capable of destroying Voldemort. 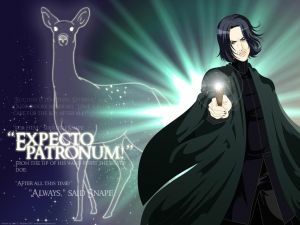 But in addition to the impact on Harry, the deaths of Lily and James compelled a despairing Severus Snape to devote the remainder of his life to helping Dumbledore protect the Potter boy… and drove Wormtail to frame Harry’s godfather Sirius for the “murder of Peter Pettigrew” and a street filled with Muggles. Basically, this is the day that changed the lives of several of the major players. Halloween 1991. Ten years after his parents’ murder, Harry spends his first Halloween at Hogwarts. At this point in the series, there’s no indication that Harry is aware that his parents’ deaths occurred on October 31. The Halloween Feast, though, is ruined by Quirrell’s famous “Troll in the Dungeons” announcement. Harry and Ron save Hermione from the troll, who has gone into the girl’s bathroom – thus starting the Trio’s friendship. Meanwhile, in an attempt to keep an eye on Quirrell and head him off at the Philosopher’s Stone, Severus Snape goes into the corridor where Fluffy is guarding something. For his efforts, his Fluffy mangles his leg, awakening Harry’s suspicions of Snape. Halloween 1993. Harry is not allowed to go to the first Hogsmeade weekend. Instead, he has tea with Professor Lupin. When Snape brings Lupin his Wolfsbane Potion, Snape becomes suspicious of Lupin having Harry alone with him – fearing that Lupin is trying to hand Harry over to his school friend, the escaped “murderer” Sirius Black. During the Halloween Feast, Sirius attacks the portrait of the Fat Lady, trying to force his way into Gryffindor Tower. In doing so, Sirius ends up wrongly confirming Snape’s suspicions about Lupin. Sirius’ actual co-conspirator is Hermione’s cat! Halloween 1994. Harry’s name comes out of the Goblet of Fire, making him the fourth champion in the Triwizard Tournament. In later years, Halloween is not so clearly delineated. We don’t know exactly what happens on Halloween during the Umbridge era. All we know is that during the weekend after Halloween, Harry and the Weasley twins get a “lifetime ban” from Quidditch. What happens in 1996 and 1997 is something of a mystery. 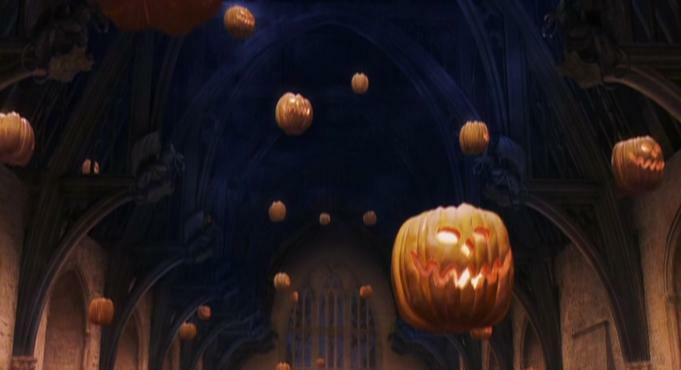 Harry finally gets a good look at Halloween 1981 on December 24/25, 1997 – after his ill-fated trip to Godric’s Hollow. Nagini’s bite, and Harry’s subsequent delirium, cause him to “see” the attack on through Voldemort’s eyes. Have a Happy Potter Halloween! Well, just one more chapter, and we’ll be at Hogwarts! In the meantime, we’re still in the process of getting there. Harry finds the platform thanks to Molly, gets his trunk onto the train thanks to Fred and George, and spends the time on the journey eating Chocolate Frogs and Bernie Bott’s Every Flavored Beans with Ron. It’s one big Weasley Fest, from King’s Cross to Harry’s new life at Hogwarts. So what do we learn about Ron? As the fifth boy in the Weasley family, he goes to Hogwarts with “Bill’s old robes, Charlie’s old wand, and Percy’s old rat.” He doesn’t have enough money for the candy cart. He’s gloomy about his own prospects at Hogwarts, but reassuring when Harry thinks he himself will be a failure. And he’s from an old Wizarding family. The conversation between Harry and Ron seems largely like something to pass the time. But in the larger context of the story, it introduces several pertinent points. Quidditch, of course, will become very important to Harry. But more important to the story are Ron’s knowledge of Chocolate Frog collectable cards, his pet rat Scabbers, and the break-in at Gringotts. Considered by many the greatest wizard of modern times, Dumbledore is particularly famous for his defeat of the dark wizard Grindelwald in 1945, for the discovery of the twelve uses of dragon’s blood, and his work on alchemy with his partner, Nicholas Flamel. Professor Dumbledore enjoys chamber music and tenpin bowling. The info about Grindelwald will become important in DH, but the information about Nicholas Flamel is crucial for the story at-hand. Nicholas Flamel is the only real-world character in the series. In real-life, he was suspected of having created Alchemy’s Philosopher’s Stone (in the Harry Potter series, this suspicion is fact). Why is this important? Well, Harry Potter and the Philosopher’s Stone is the actual title of the book. Scholastic didn’t think a title with “Philosopher” in it would sell in the U.S. market, so the title was changed. But elsewhere in the world – including the U.K. – publishing houses have gone with JKR’s original title. In Alchemy, of course, there’s no such thing as a Sorcerer’s Stone. But creating the Philosopher’s Stone (i.e. turning lead into gold) is the ultimate goal of Alchemy. The reference to Nicholas Flamel is also pertinent to the Gringotts break-in that Harry and Ron discuss on the train. The Philospher’s Stone was the object of the break-in, and will later be the object of attempted theft at Hogwarts. And let’s not forget that Dumbledore’s Chocolate Frog card introduces Harry to moving portraits. By the end of the day, he will be living in a House that you can’t enter without giving a password to a portrait! And then, there’s Ron’s rat Scabbers. Ron doesn’t know it yet (in fact he won’t know it for nearly three more years), but Scabbers isn’t really a rat at all. He is actually the animagus form of Peter Pettigrew – a Hogwarts friend of James Potter’s who betrayed Harry’s parents to Voldemort and who will later help Voldemort regain a body. As always, JKR is very economical, laying the groundwork for later elements early on when readers least expect it. I mean, seriously, did anyone really read the Chocolate Frog card the first time they read this chapter? But I’ll bet most re-readers took a close look at it the second time through! The card itself has a role to play, beyond the flat facts stated on its face. Now, if only one of the boys can just collect Agrippa! I have come to the conclusion that lemon drops are the gateway drug into the Potterverse. It’s a Muggle sweet, you know, that the Headmaster is particularly fond of. Several days ago, I created a Content Map for Chapter 1. (And yes, it included lemon drops). 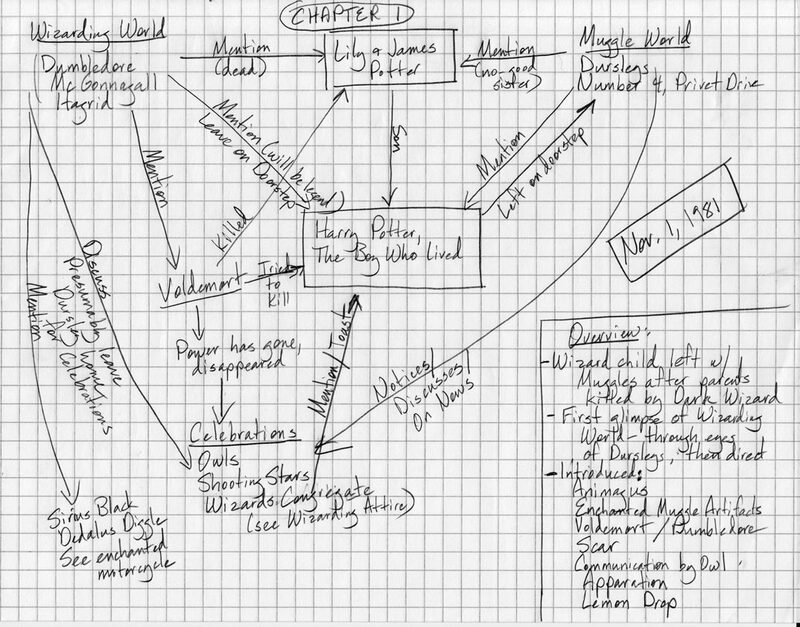 The map shows, basically, that Rowling laid the groundwork for the entire series right here in the first chapter. We’re missing references to only one major character (and a second minor one) who prove significant in the events leading up to Harry Potter’s being left, an orphan, on the Dursleys’ doorstep. And what happened in Godric’s Hollow on All-Hallow’s Eve, 1981 – and what is happening on Privet Drive on All-Saints Day – are the events that provide the key to everything else. Let’s break down the chapter a bit. I’ll place the most serious spoilers (plus a few asides) in a smaller font – in parentheses. The “Put-Outer” Dumbledore uses to …put out… the street lamps initially seems like a little touch of gratuitous magic – something to show Muggle readers a hint of what Wizards can accomplish. But in Year 7, we get the payoff. The “Put-Outer” is really called a Deluminator. And it can do a lot more than turn off the lights on a Muggle street. While Dumbledore fiddles with his lemon drops, the stern, severe, but compassionate McGonnagall puts Muggle readers on notice that Wizards intentionally hide from the Muggle World (thanks to the International Statue of Wizarding Secrecy). But perhaps more significantly, Muggle readers learn that someone who apparently must not be named has terrorized the Wizarding World over the past 11 years. Dumbledore intends to leave the orphaned child on the Dursleys’ doorstep with no explanation but a letter. Is his judgment sound? Is he out of his mind? 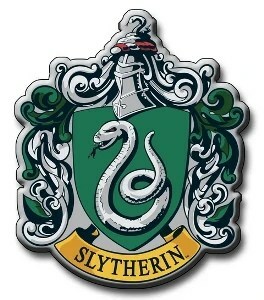 Is this a result of the International Statute of Wizarding Secrecy? Is it necessary in order for the magic to be sealed that will protect Harry when he’s living with his relatives? A whole book could be written on the scar. Right now, it’s just a lightning-shaped cut. But it will ultimately help Dumbledore unravel how young Harry survived Voldemort’s killing curse, how the scar connects Harry to the man who tried to kill him, and what Harry needs to do about it. When next we meet Harry at 10 years old, he will consider the scar the only cool thing about his physical appearance. It will help the Weasley twins recognize him as being Harry Potter on the train to Hogwarts. And soon, it will burn in the presence of Voldemort. This small cut on baby Harry’s forehead will prove to be one of the keys to the larger story.